It’s great to be a dad during the holidays. You get to play Santa, hang wreathes with blinking lights and tip-toe around the house at night placing presents under the tree. But amid the excitement of seeing kids claiming their Christmas-morning booty, there is a tougher challenge to meet – how to teach your kids about charity. Requests for donations are everywhere in December. 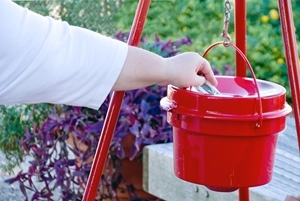 The mailbox is full of solicitations from schools and nonprofits, and you can’t visit the supermarket or drugstore without seeing bell ringers with their red kettles. Children are exempt from these commercial requests, of course, but wise dads know that charitable giving is a practice that has to be taught. It can be tough for children to part with the little money they have earned through household chores, family allowance, dog walking jobs or coins picked up off the sidewalk. 1. Let them see you donate, and be a father who leads by example. 2. Ask them to give an object – like a soup can for a food drive – instead of the precious coins in their piggy bank. 3. Let them choose the charity themselves, so they gain some control over the process. Some dads involve their kids by collecting all the solicitation letters in a single pile, then holding a family vote on where to send a check. 4. Have them choose a charity gift from their rooms, such as outgrown clothing or a forgotten book. 5. Practice the three-cup strategy for their allowance, dividing each month’s amount into one pile for saving, one for spending and one for giving.